S&P 500 is down 12% from October highs and up 12% from December lows. The huge volatility and low liquidity, especially in late December, has managed shaking out many investors. AAII sentiment is so bearish, that we are starting to feel the contrarian in ourselves getting a bit excited about a possible mean reversion trade. As hedge funds were trapped long and wrong the urge to “hedge” in late December created the wash out move we saw. The entire violent period from early December to now has created a complex psychology among investors. People that wanted to buy the dip didn´t buy it, at least not enough. The shorts that looked like Gods only a few weeks ago are now sweating. Greed and fear is the number one driver of markets here. With S&P 500 having gained some 12% from lows the bounce we suggested in late December is reaching the max short-term potential in ours view. We are approaching the huge 2600 resistance shortly. Note the negative trend at the big 2600 level as well as the 50-day average approaching. The plan was a bounce (we got it) and we feel the prudent thing is taking some chips off the table soon. Given the recent fall in volatility, why not start looking at some hedges as well. NASDAQ has put in a similar move as the above chart of S&P 500. We are approaching the negative trend line as well as the 50-day average. 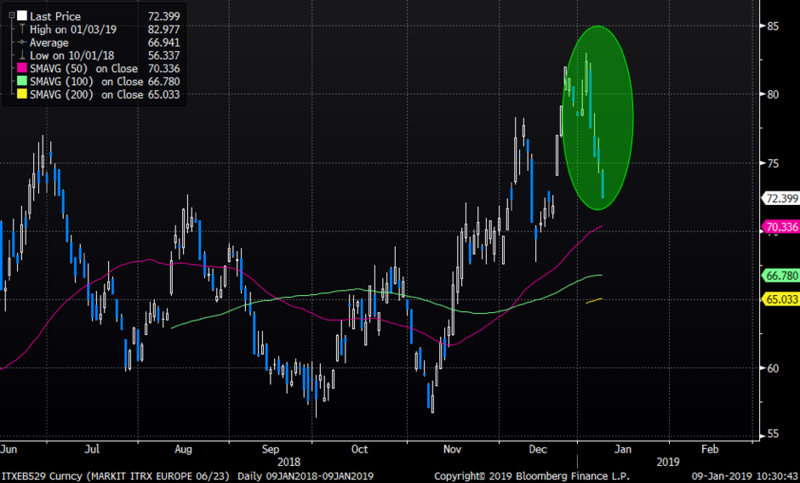 An overshooting is not impossible, especially given the still rather low liquidity environment, but chasing longs here is a late trade for the short-term oriented investor. Credit is a space we follow closely. As we have been pointing out, credit became way to rich and we are now seeing the biggest move down since the entire move higher started in early November. Below is a chart of the European main credit, iTraxx main. 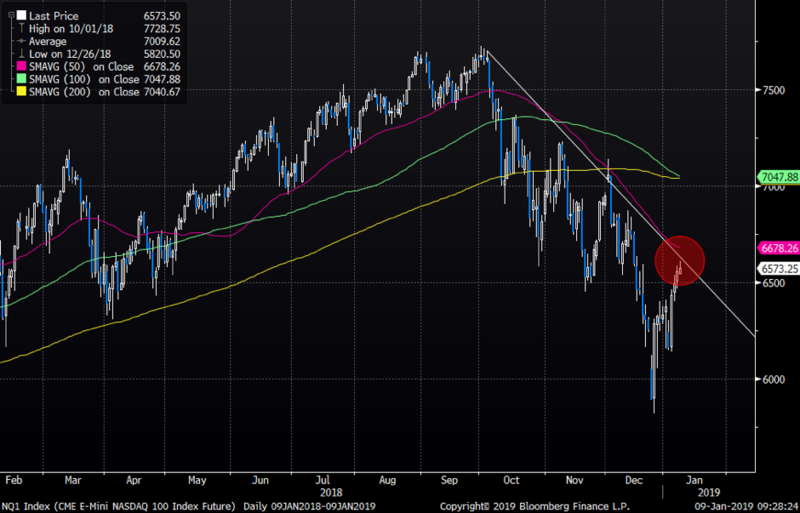 European indices have bounced as well, but the move has been less violent compared to the moves we have seen in the US. 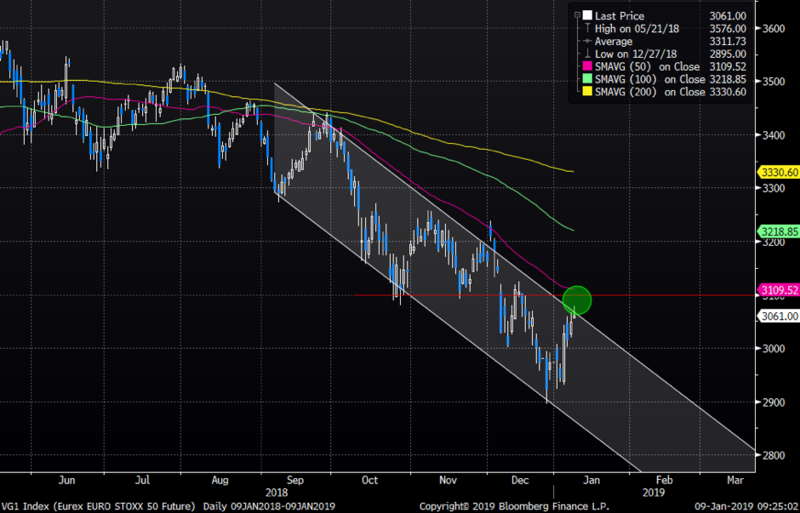 Eurostoxx 50 bounced well on the lower parts of the trend channel and is now trading in the upper part of the channel that has been place since September. 3100 is a big resistance area to watch carefully. Note that the 50-day average is approaching quickly here. 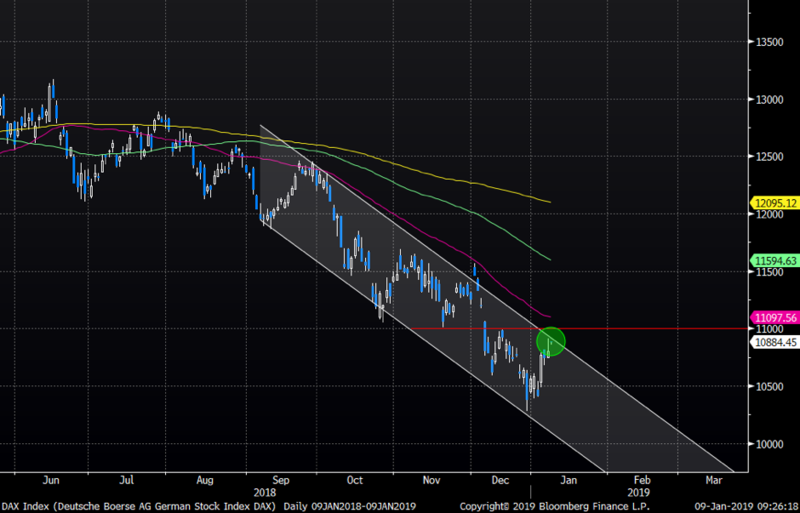 The DAX paints a similar picture. Up from the lows of the channel that has been in place since September. 11 000 is a very important and big resistance to watch. All in all, most indices are approaching big resistance levels soon. The psychology of the crowd is complex and people have been thrown between fear, hope and greed. If we felt the contrarian bounce trade setting up in late December, we are now starting to feel the inverse. Taking the extra longs off the table seems to be the prudent thing to do here. 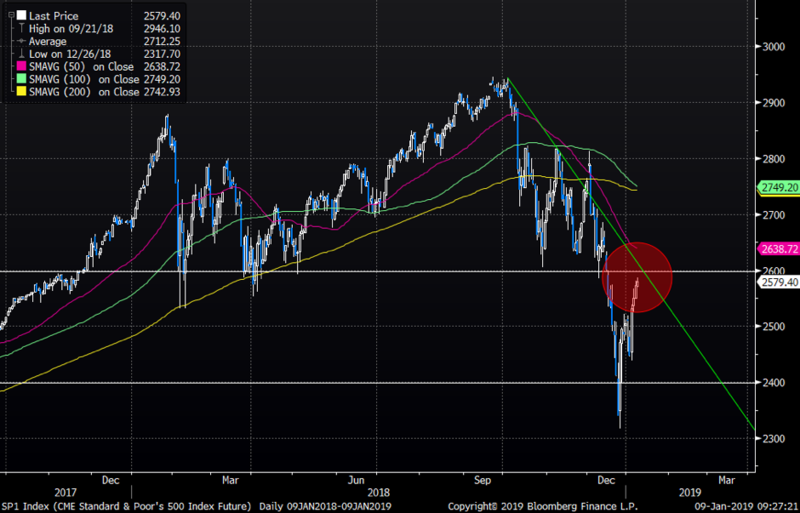 Crash Déjà vu or Contrarian Bounce?